Beautifully engraved specimen certificate from the American Graphophone Company dated 190_. 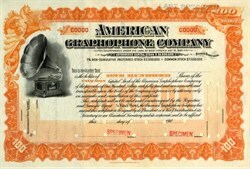 This historic document was printed by International Banknote Company and has an ornate border around it with a vignette of an old horn Graphophone. 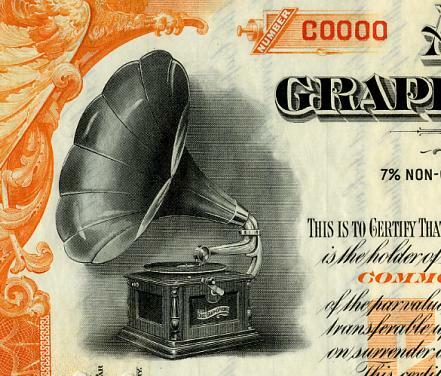 In 1887, the American Graphophone Company was organized by Philadelphia capitalists to develop the improved product. A small plant, having a capacity of three or four machines a day, was established in Bridgeport, Connecticut. Records, at this time, were almost exclusively of the popular-novelty-comedy variety. Because of the emphasis on volume of sound, a loud voice was more important than a finely cultivated one. Early in 1887, Jesse H. Lippincott acquired from the American Graphophone Company the exclusive right to rent or sell the Graphophone under the Bell and Tainter patents. A little later, Mr. Lippincott purchased the Edison Speaking Phonograph Company and set up the North American Phonograph Company to promote the sale of both products nationally.